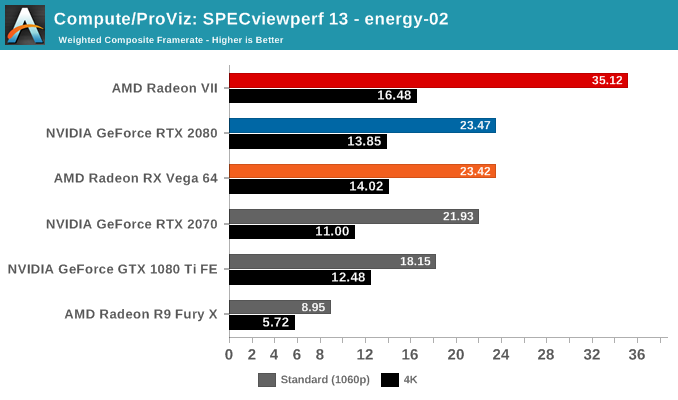 With AMD strongly pushing the Radeon VII as a prosumer content creation card, it behooves us to look at rendering, CAD, and professional visualization performance. 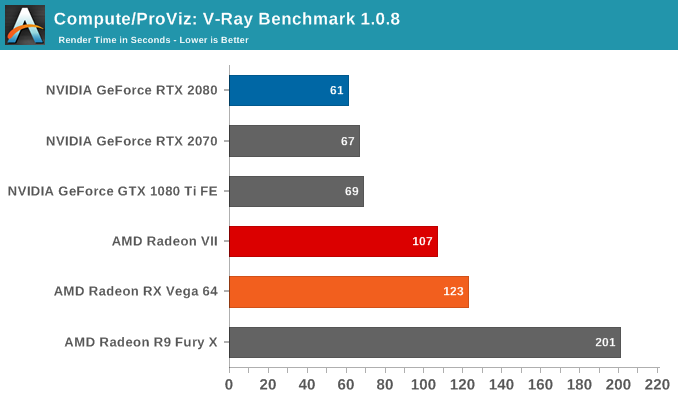 However, accurate and applicable benchmarks for this field are not so easy to find, especially since performance is highly dependent on workflow and proprietary licensed ISV software. Given AnandTech’s audience, which often includes engineers using these applications in critical production environments, our goal is to provide the most relevant metrics. However, as Ian has discussed previously, the route to the most accurate workstation benchmarking for professional applications is in the hands of ISVs, who are at best blasé and more typically negative about providing access, even at the prospect of lending limited software licenses in return for ongoing discussion and third-party benchmark data of their software. While we didn’t have time for complete benchmarking of video editing/production software such as Adobe Premiere Pro CC, we will be looking to include that in the future. 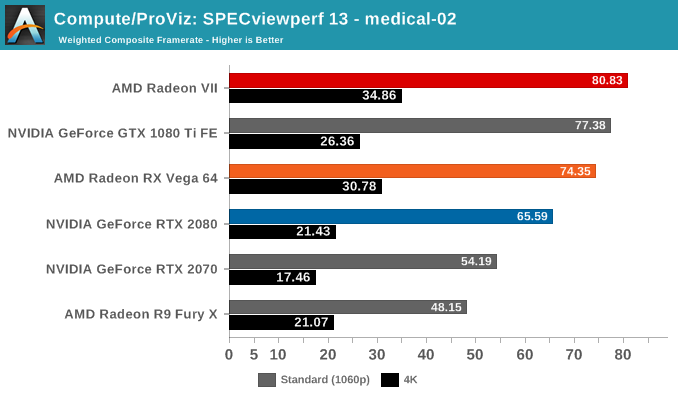 Looking over the results, it's clear that certain viewsets tend to perform better on one vendor's hardware than the other's. 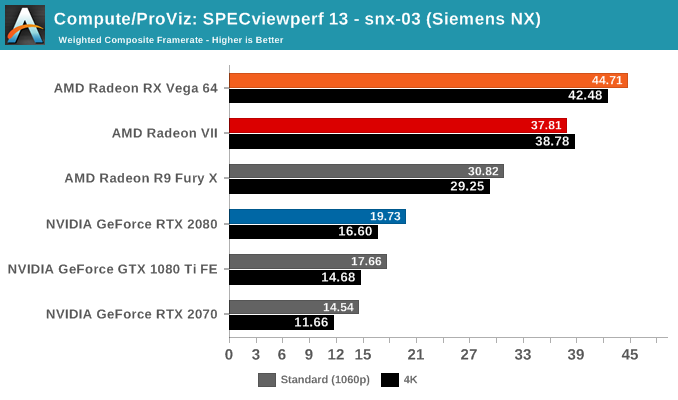 In those cases, the Radeon VII doesn't buck the trend, though in Siemens NX the lower performance is more likely than not related to driver maturity. 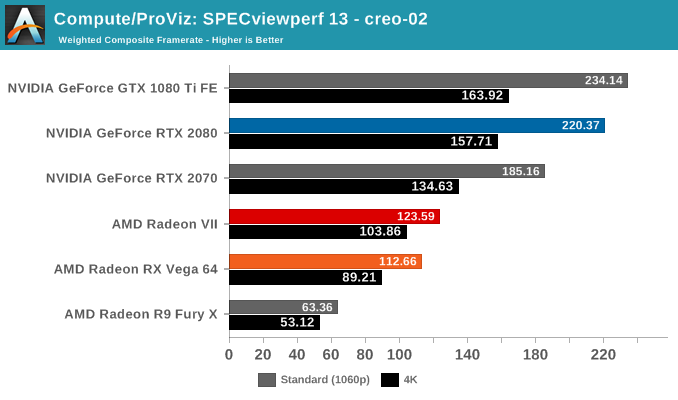 In the reverse scenarios like in creo-02 or maya-05, the Radeon VII is in a similar spot, naturally ahead of the RX Vega 64 but behind the competing RTX and GTX cards. 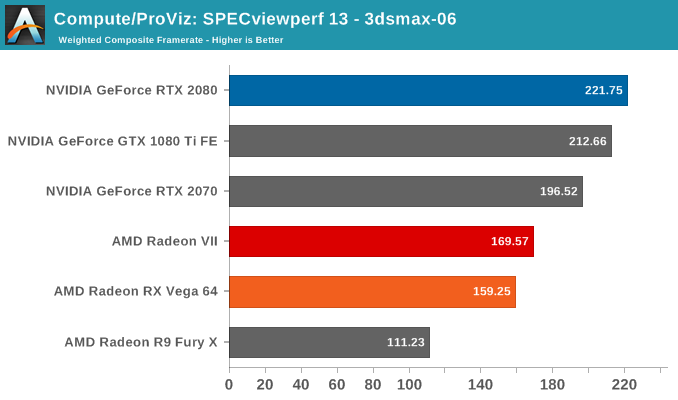 If anything, the results highlight the importance of software maturity for newer hardware, but there are definite signs of Vega 20 being a powerful workstation card. 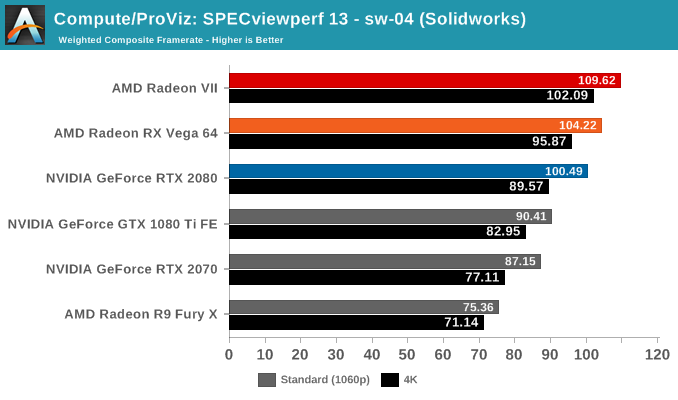 The caveat is that it doesn't seem to change the overall landscape for worksets that traditionally perform well on NVIDIA hardware. 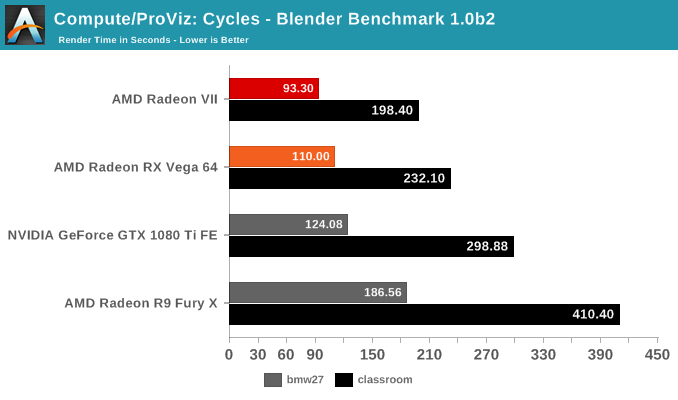 Our next set of benchmarks look at rendering performance. 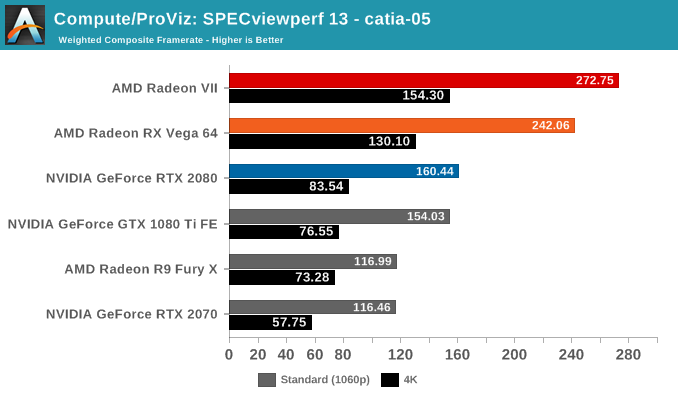 To be clear, given the nature of ‘render wars’ as well as the adoption of CUDA, the featured render engines are not necessarily indicative of the overall GPU renderer landscape. 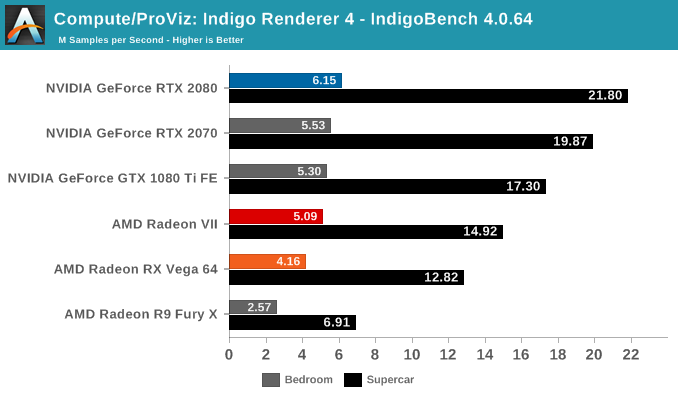 Because we are looking at the Radeon VII, it’s not applicable to include some of the more popular renderers, such as Redshift and Octane, which are CUDA-only, and similarly the presence of Indigo Renderer helps as another datapoint even though it is less popular. 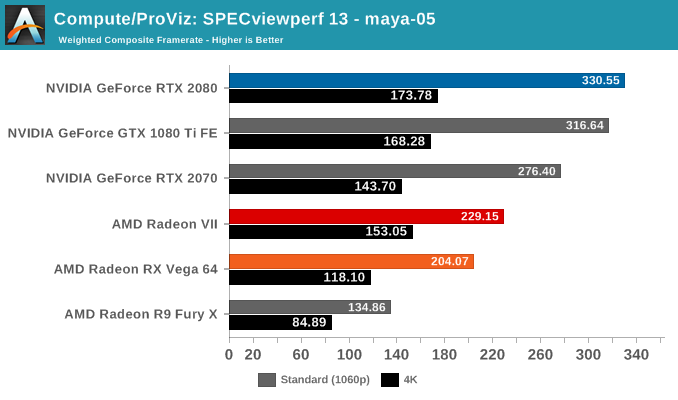 To note, official Blender releases have yet to incorporate CUDA 10, and so RTX 20 series cards are not officially supported. 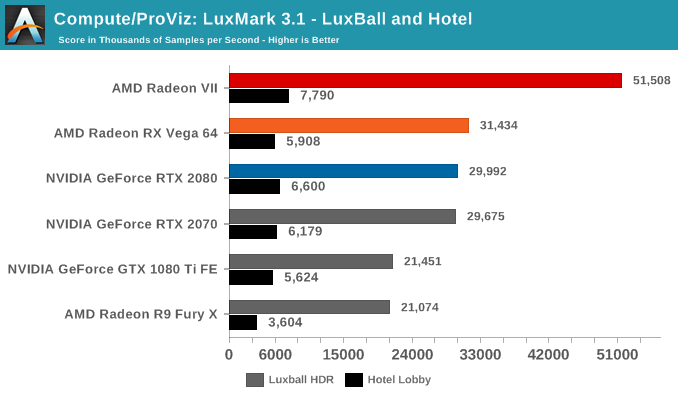 V-RAY here is the only test that utilizes CUDA for NVIDIA cards, while the rest all use OpenCL. 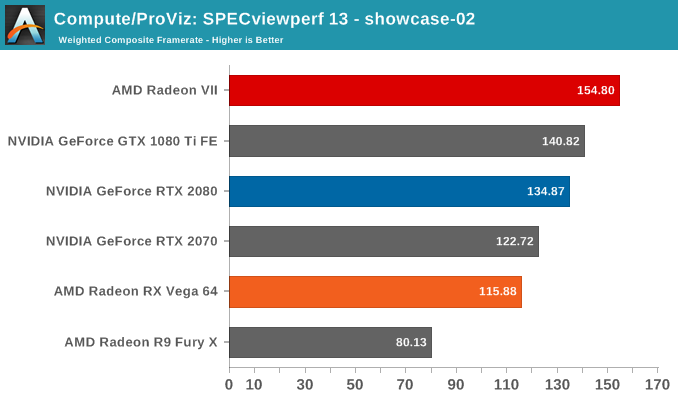 The results seem broadly similar to SPECviewperf, where the Radeon VII continues to excel at workloads where AMD hardware generally fare well.